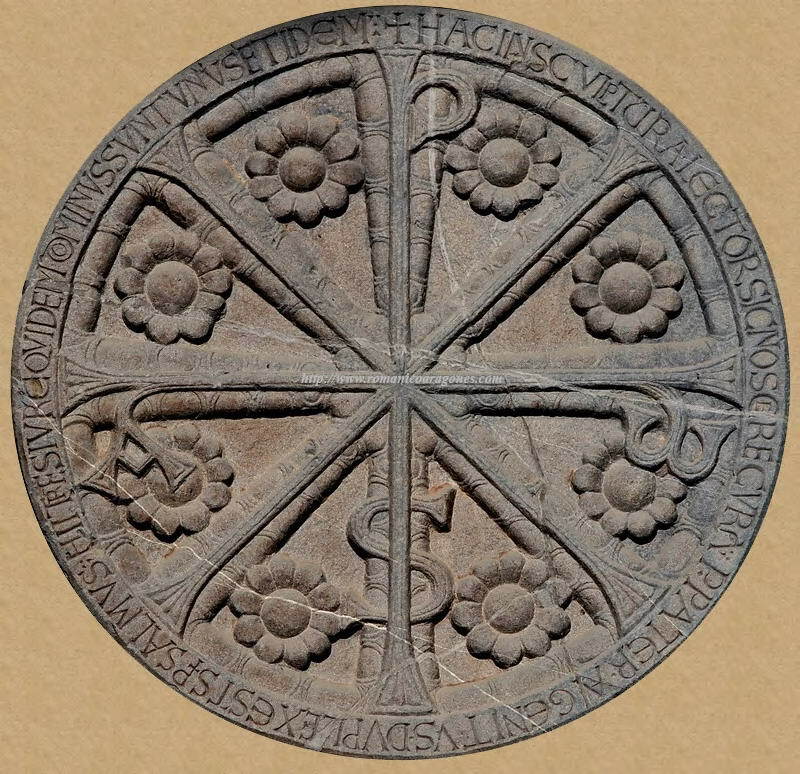 The Bishopric of Jaca was created by powerful King Sancho, who by this time was vassal to the Pope and "king of aragoneses and pamploneses", having undertaken the construction of his own royal city on returning from Rome. He then appointed his brother, the Infante García (See family tree), as bishop. In 1077 Sancho decided to build his city in the Roman style: a walled city with streets laid out in the Roman grid system. 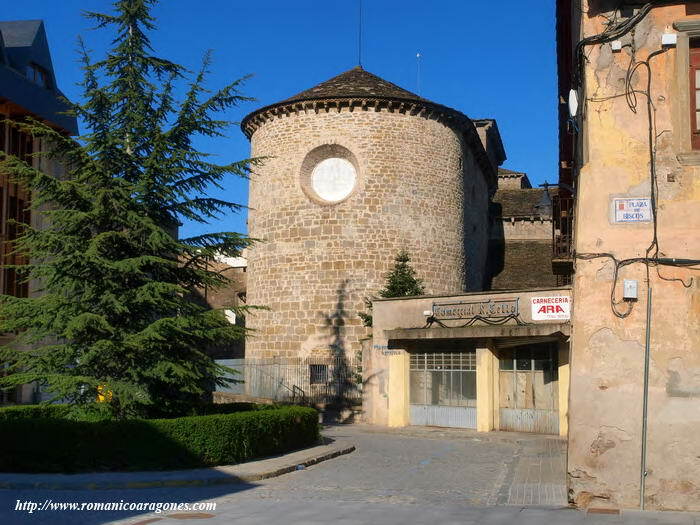 He also decided to move his royal residence from the Royal Fort (where the Benedictine monastery, ‘Las Benitas’, is now located) to a more central location (today the site of the Clock Tower in Jaca). However, where there is a bishop there must also be a cathedra and thus the construction of Jaca’s cathedral was begun, a short distance to the east of the primitive church of San Pedro El Viejo, ‘the old’, so called to differentiate it from the new cathedral which was also dedicated to St Peter. The growth in importance of the cathedral resulted in the eventual disappearance of the primitive church, of which some archaeological vestiges are all that remain today. The first phase of building has been established as taking place between 1076 and 1082, with construction beginning at the eastern end. The layout from the outset was defined as a rectangular basilica with transepts which did not extend laterally beyond the aisles; a design which was repeated in Frómista, Silos, Arlanza, Dueñas. 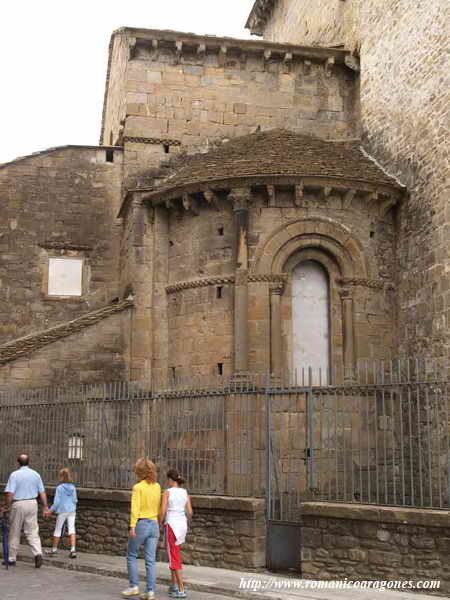 (The argument put forward against this chronology is based on the inscription over the church entrance in Iguacel; a church dated 1072 when it was redecorated in the estilo jaqués or Jaca style. Hence, Jaca and its style was already a reality in 1072). Building began on Santiago de Compostela in 1075 and on Leon’s first cathedral in 1080. In 1082, the perimeter of Jaca’s cathedral was finished, as were almost all of the apses. However, construction was completely brought to a halt at this point due to a confrontation between Bishop-Infante García and his brother, King Sancho. Their sister, the Countess Doña Sancha, considered “one of the most intriguing minds of the kingdom”, was thought to be behind this bad relationship between the brothers. In September 1082, the countess was enjoying great prestige. 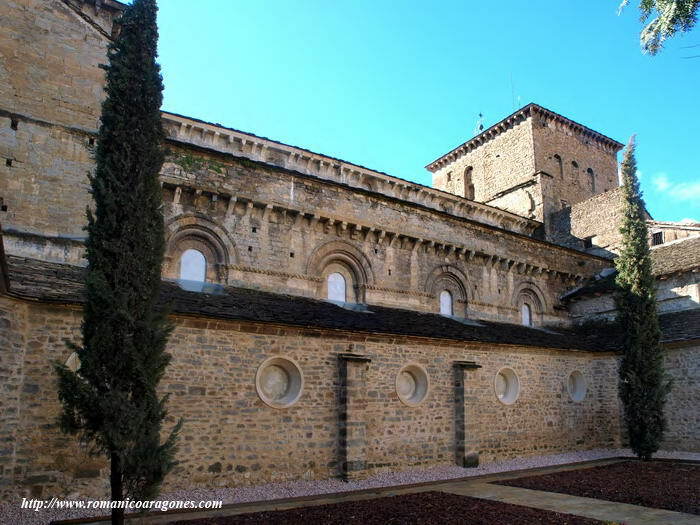 The king entrusted her with control of the monastery of San Pedro de Siresa and, soon after, also with the bishopric of Pamplona which Sancho had seized from García. Behind this last manoeuvre was the confrontation which existed between García and his followers, who were opposed to the interference of foreign powers in affairs of the kingdom, and King Sancho and the Countess Sancha, who had very ‘pro-European’ tendencies. In the end, the king and Doña Sancha were triumphant and this permitted the Holy See to gain spiritual control of the kingdom and install the official Roman rite to replace the old Hispanic or Mozarabic rite used until then. 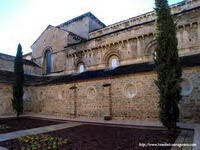 It also opened the way for the influence of Cluny to expand across Spanish territory. 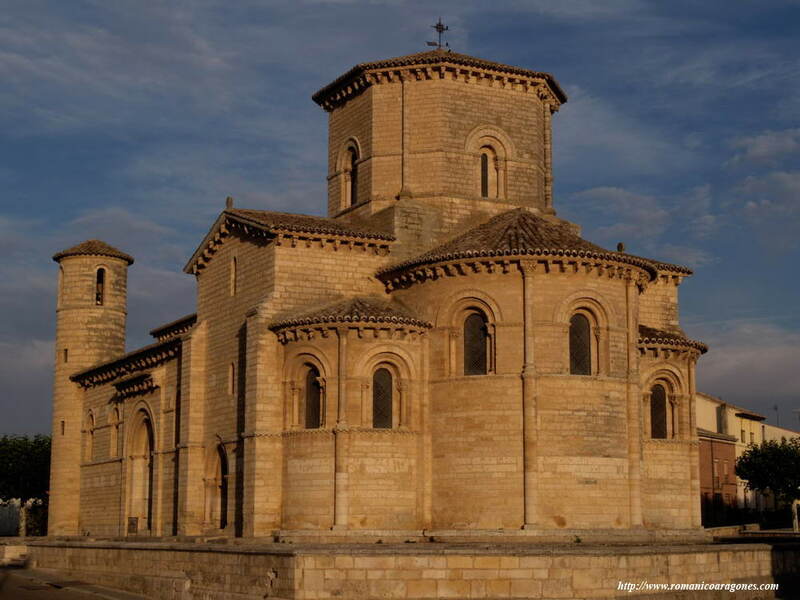 Between 1086 and 1099 royal investments were channelled into the construction of Montearagón (begun in 1093) and the continuation of the building in Loarre, García’s favourite project, on which most of the work was done after 1071. Likewise work was done on the upper church at San Juan de la Peña, which had been consecrated in 1080. The second phase of construction at Jaca took place between 1104 and 1130 during the reign of Alfonso I. During this phase the stonework along with the sculpture decoration was completed. The master mason known as the ‘Master of Doña Sancha’ (name given to the anonymous artist responsible for sculpting the sarcophagus of Doña Sancha) worked on the cathedral in this period, and some of his work is also to be found in Santa Cruz de la Serós. 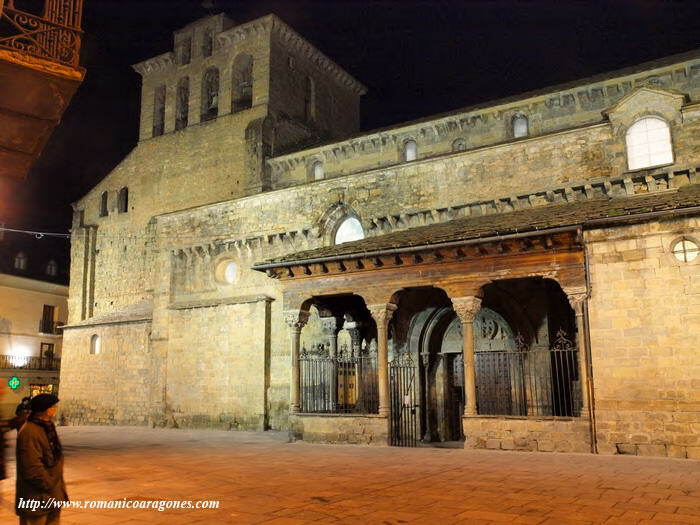 Following completion of the cathedral around 1130, much of its activity diminished due to the fact that the centre of power had moved south to Huesca. 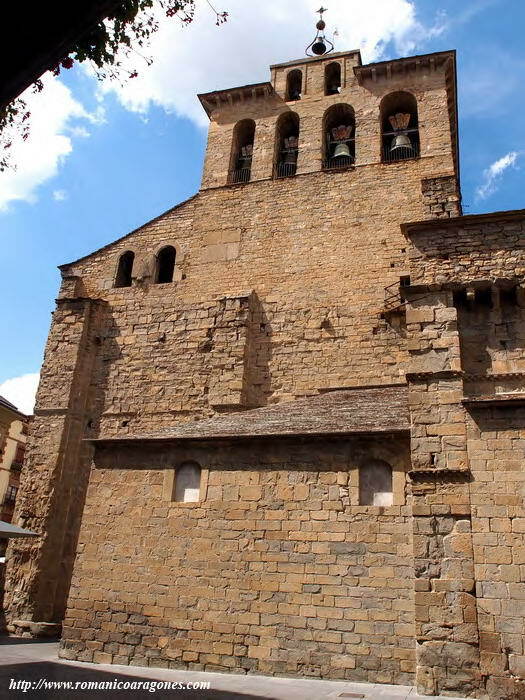 The Bishop lived in Huesca by then and only visited Jaca occasionally. Photo 2 shows the eastern end of the cathedral taken from the square known as Plaza Biscós. Standing out, because off its disproportion to the rest, is the central apse, which was erected in 1790 following the demolition of the original Romanesque apse “to avoid filtrations and damp” and to increase the area of the choir (the real reason behind this piece of construction). 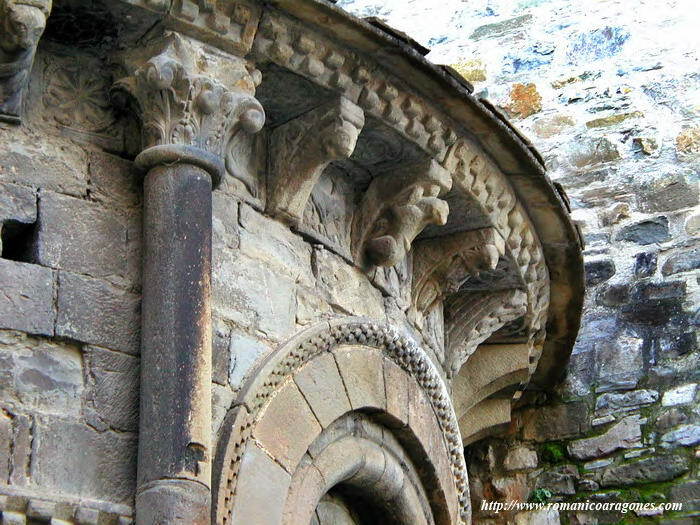 The corbel table on the exterior of the central apse is from the original Romanesque apse. The Carthusian monk Friar Manuel Bayeu y Subías was one of those involved in the reform of the central apse. He decorated the interior walls and the vault with scenes from the life of Saint Peter. Viewing possibilities of the exterior of the cathedral are limited because it is surrounded by buildings. However, the south façade stands in a square which provides space from which it can be contemplated. Photo 1 shows the south façade with its porch, known as the ‘Lonja Chica’ (small atrium or porch), which opens onto the market square. A medieval standard of measure, known as the vara jaquesa (Jaca yardstick), can be seen chiselled into the stone on the right of the door – similar standards of measure can be seen in the market square in Sos del Rey Católico or on the right of the entrance to the church of Santa María in Uncastillo. From this viewpoint the different heights of the side aisle and central nave can be discerned as well as the clear differences between the original south aisle and the porch and other later additions. Materials from the cathedral cloister were reused for the construction of the south porch which is of a later date than the main cathedral. The south portal projects slightly into the porch which protects it from the elements. 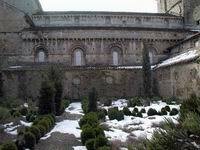 Photos 3 to 6 show the magnificent south apse, the only surviving apse from the original cathedral remaining intact. The sculptural decoration is the work of the master mason known as the ‘Maestro de Jaca’ (the Master of Jaca). 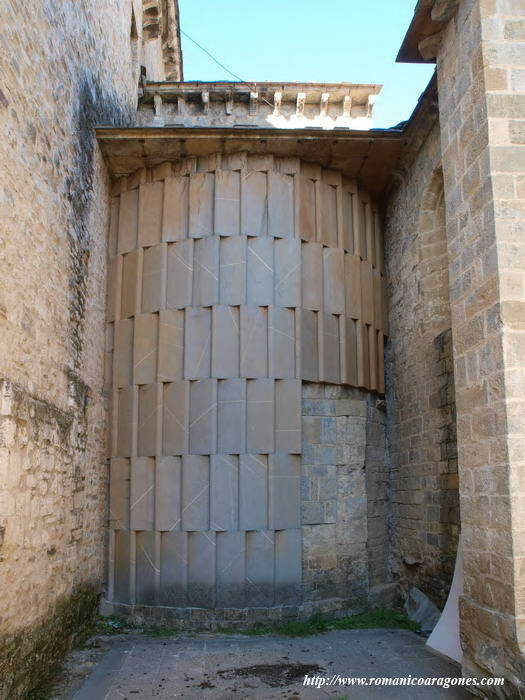 The apse wall is divided into three horizontal panels , separated by bands of the chequerboard pattern which is characteristic of Jaca; one band running under the window and the other as a continuation of the abaci of the capitals of the window columns. 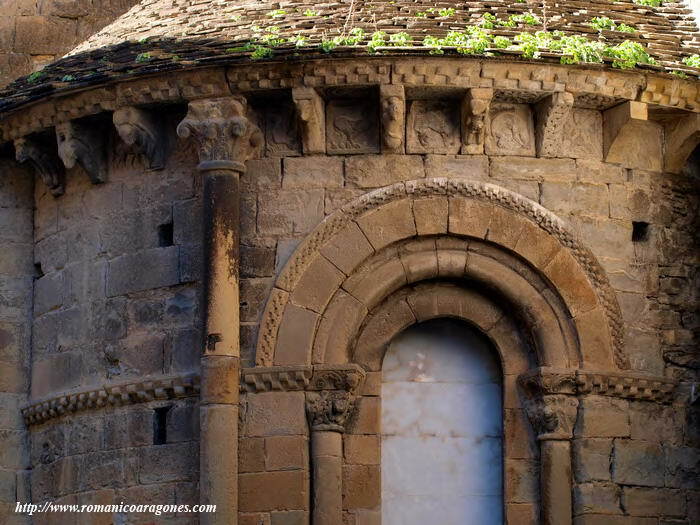 The same chequered pattern surrounds the voussoirs of the semicircular arched window with baquetón moulding (name given to a form of large roll moulding common in the area), and also provides the finishing touch under the roof. This last band of chequered ornament is supported by carved corbels. There are also metopes to be seen under the eaves of the apse. To the left of the apse window there is a classical column erected against the wall and extending all the way up to the roof from the pilaster which it rests on about a third of the way up the wall. The column has an attic base, a Corinthian capital and a smooth shaft. There was probably another one on the other side of the window before the reform of the central apse which disappeared during the reconstruction. 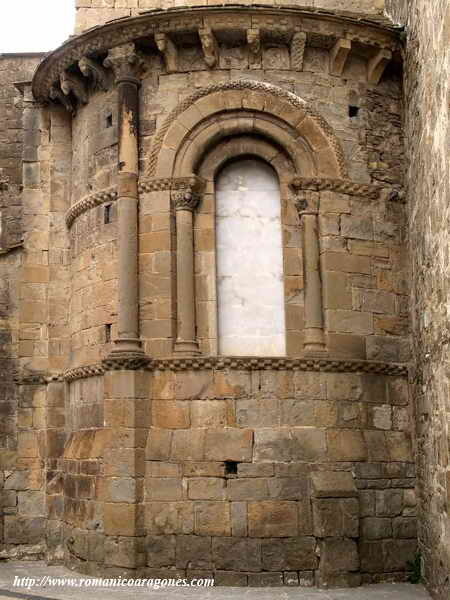 The window in the centre of the apse is a typical example of the Jaca-style window: flanked by two columns, one on either side, crowned with capitals – the whole effect giving the appearance of a little door. 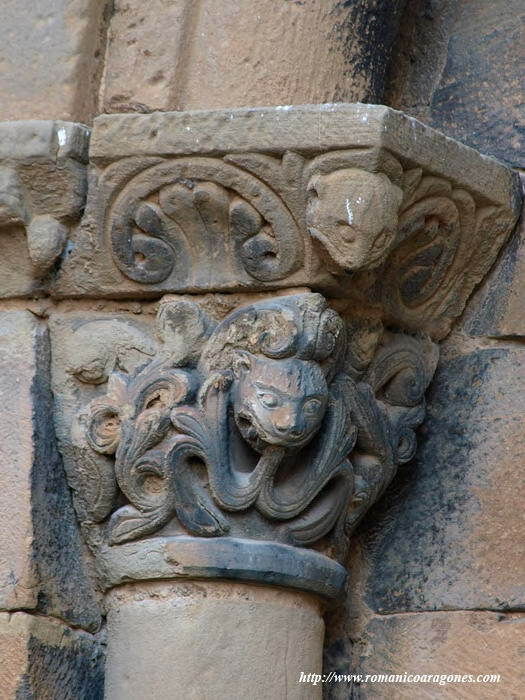 The south capital is decorated with interwoven foliage, which emerges from the jaws of a lion in the corner. 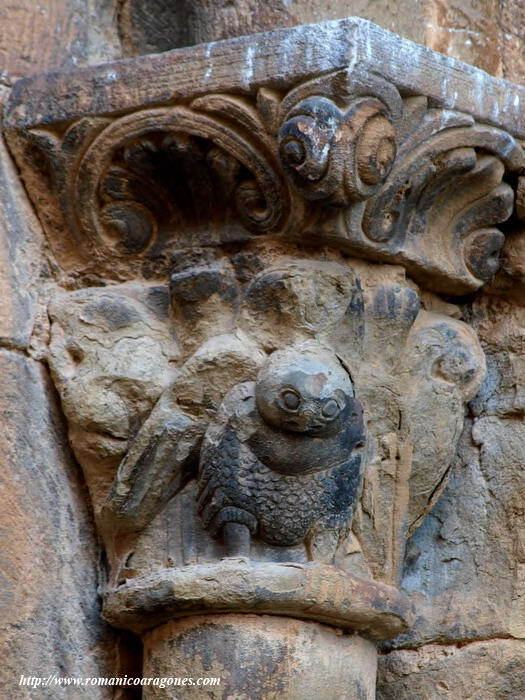 The north capital, which is in a more deteriorated state, shows an owl. The north façade of the cathedral can be viewed from inside the old claustral space – the cloister itself having been rebuilt [7 to 10]. In order to contemplate these lesser known views of the cathedral one must enter the cloister from the space now dedicated to the Diocesan Museum. From here the large windows of the north façade can be seen and over the windows the original cornice, held up by corbels. The cornice remained as part of the wall when it was further elevated to construct the ribbed vault of the north aisle which is there today . It is also worth pointing out the north arm of the transept with its large window . It can be seen from these photos that the arms of the transept do not project from the line of the façade of the north aisle. 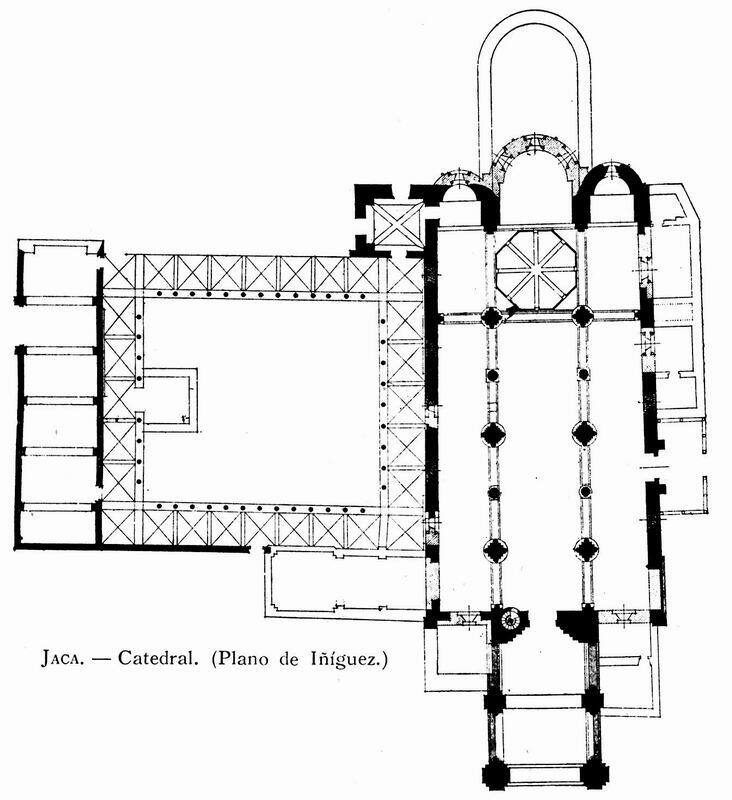 The cruciform plan of the cathedral can only be observed on the floor plan of the cathedral. At the western end of the cathedral is the main entrance. It is approached through a ‘penitential’ porch which guided the faithful, through five large openings in its walls, towards the main door. The porch was seen as a place of atonement and to this end the Chrismon and text over the door were meant to instruct the people. Over the course of time, three of the entrances into the porch were closed, leaving only the western one and that which is adjacent to the south side open. Above the porch, which was probably no higher than the central nave originally, the sturdy belfry was erected at a later date. The changes in material of the different phases can be seen clearly . There is one part of the cathedral in Jaca which is rarely talked about and which few people know about. 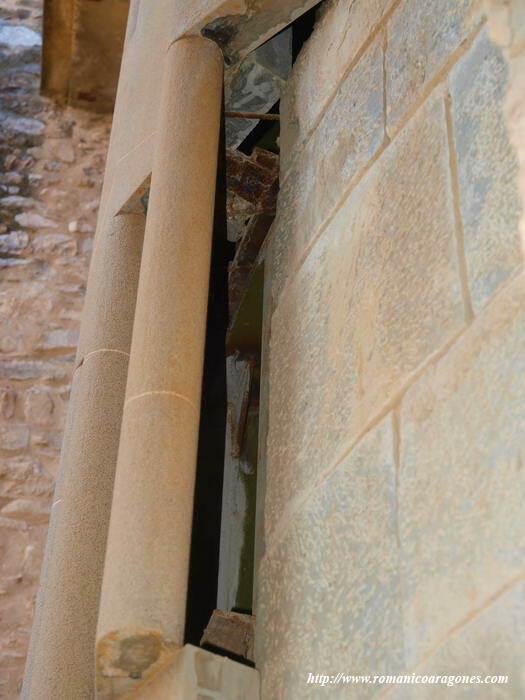 I am referring to the exterior of the north apse of the cathedral which is thoroughly hidden from view behind the renovated and enlarged central apse and further protected from public scrutiny by a railing and a little tree. 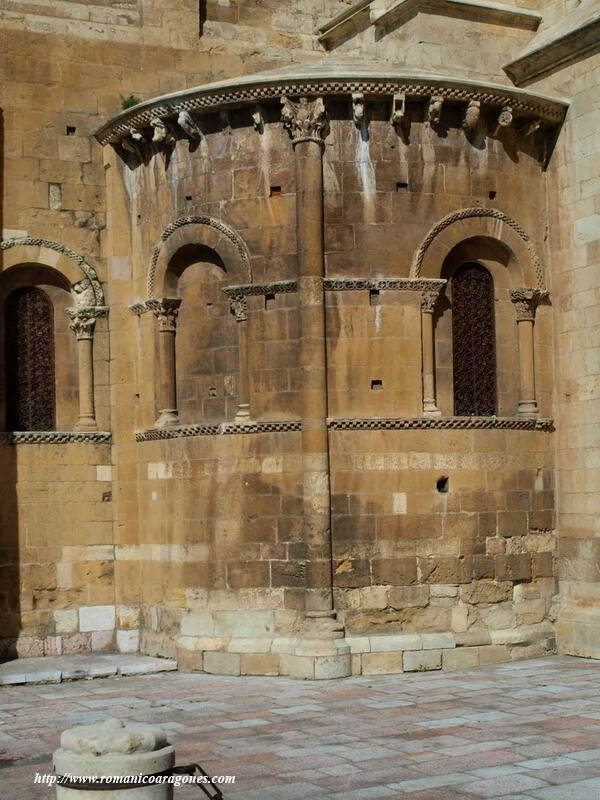 There are those that say that this is a good thing given that the aesthetics of the exterior of this apse, when seen as a whole and at first sight, leaves much to be desired. 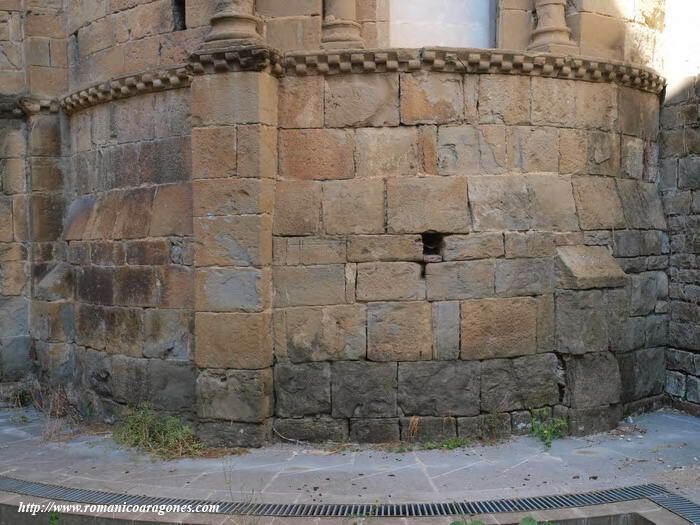 Several courses of overlapping stone slabs laid horizontally over the outer wall of the apse are the cause of this effect. This ‘finish’ was put in place following a discovery made on the demolition of a building which was adjoining the exterior of the apse. It was revealed that the outer layer of stonework of the apse had been removed in order to build this adjacent building in the first place. Thus the core of the north apse wall was left stripped bare of its outer ashlar layer. The placement of the stone slabs over the wall to cover the defect and protect it from the elements was a ‘compromise’ at the time. It was deemed a ‘compromise’ solution because of the reversible nature of the protection, given that the stone slabs have only been placed in front of the exposed core layer; resting on each other and fixed only with metal rods. As can be seen in the photo on the right, a chamber has been left between the two surfaces. Hence, the present situation does not prevent the wall being finished off at some future date – should such a decision ever be taken – using materials and techniques more in keeping with the aesthetics of the building. At the same time as the protective slabs were put in place, trial excavations were carried out at the base of the union between this apse and the central apse in order to determine whether this semicircular central apse had an external straight section. The excavation hole can be seen in the above photo, marked with a yellow arrow. The view through the excavation hole reveals without a doubt that no straight section of the presbytery is projected to the exterior; the base of the central apse projects forth in a semicircle to the exterior. 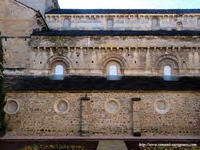 As far as the formal workmanship of the original section of the exterior of the north apse is concerned, it is logically very similar to that of the south apse. The bases in both cases are constructed with stone which is more roughly hewn and less elaborated than the ashlar which can be seen above the frieze of chequerboard ornament. Vertically laid stones are plentiful and there are no stonemasons’ marks to be seen. There are other elements which support the argument that Jaca cathedral was initiated as a Lombard style structure. For one, there is the spacing of the interior supports which separate the nave and side-aisles. The spacing of the cruciform pillars which alternate with circular pilasters is Lombard spacing. One section of the groin vault of the central nave corresponds to two similar sections in the side aisles. 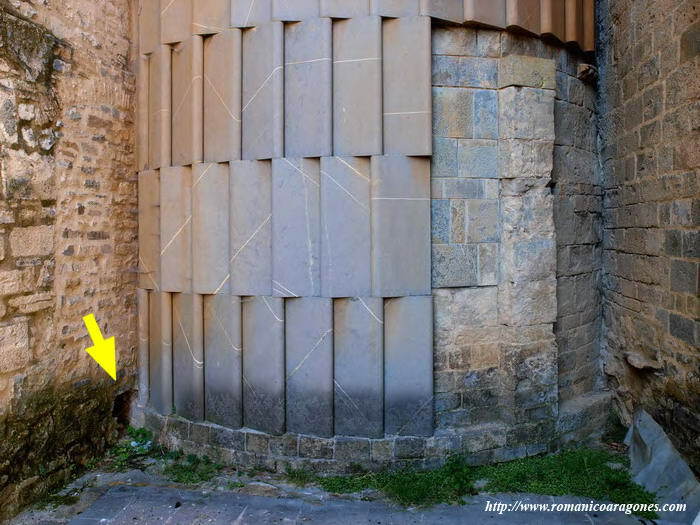 This explains the triple corners of the central cruciform pillars in Jaca cathedral. Later, the architect lost courage and construction of the planned vault was aborted; instead the three-cornered pillars were abandoned lower down, the roof constructed with timber and the side walls were built lighter and devoid of receptor elements for a groin vault. The absence of triumphal arches, a feature characteristic of the Benedictines, between the main body of the cathedral and the sanctuary is more evidence of Lombard beginnings. This fits in with the fact that double columns were later added at points between the union of the sanctuary and the main body of the temple. These columns were finished off with ‘supplementary capitals’ formed by one complete capital and the upper part of another one. This was done in order to achieve a height which was coherent with the working module of the Master of Jaca, from whose capitals spring the ribs which run from sanctuary to nave and aisles. More information will be given on this later. Nevertheless, the north apse, despite its currently unattractive facade, supplies us with considerable information regarding the true commencement dates for the construction of Jaca Cathedral. Bernabé Cabañero, in the abovementioned article, points out, as key for the dating process, the Lombard style of the first seven courses of stonework of the north and south apses. According to Bernabé Cabañero, building began at the base of the the north apse; it then continued at a different pace on the south apse while at the same time construction got underway on the two cruciform central (three-cornered) pillars. He defines the situation at that time as being a real “construction chaos”, with several projects going on at the same time, and changing according to circumstances. A temple with magnificent sculptures, a reference in its time, immersed in an authentic construction chaos. Traducción cortesía de Bridget Ryan.